Update: Thanks to Karen, we now know how it works with the discount for the Twinklings sale. The discount does not appear on the order on line, but it is being manually discounted by 40% at their end. The discount applies to everything that they have in store not just the H20s. All orders are being despatched within 10 days and should be in the UK 5 days after that. Another Note: Have a look at this discussion at Splitcoaststampers, there you get some information about the ongoing sale at LuminArte. IMPORTANT UPDATE: Ann and Snadie thanks for pointing me to this!! The company who produces Twinkling H2Os is going out of business. What a shock!! They have a huge sale of 40-50% off. So hurry if you still want to get some. WICHITGES UPDATE: Die Firma, die die Twinkling H2Os herstellt wird in nächster Zeit geschlossen. Was für ein Schock! Es gibt einen großen Abverkauf mit 40-50% Rabatt. Wenn ihr also noch welche bekommen wollt, dan beeilt euch! I got a few questions about Twinkling H2Os after my colouring tutorial last week, so I decided to write a short informational post about them, which will hopefully help. Ich habe einige Fragen zu den Twinkling H2Os erhalten, nachdem ich mein Colorationstutorial letze Woche gezeigt habe. Deswegen schreibe ich hier ein paar Informationen über sie zusammen, die euch hoffentlich weiterhelfen werden. Twinkling H2Os are available in 156 colours, they are solid and come in little pots. Those pots are available in two sizes. Just take the smaller pots, they last forever! Most of the time I only use my Twinklings to deepen the colours and set some accents of my images which I already coloured with water soluble pens. The above image shows my favourite colours (which are based on personal preferences). 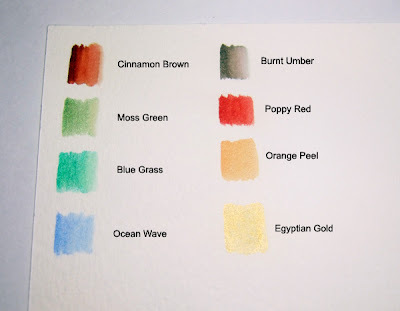 I use Poppy Red for cheeks, Moss Green and Cinnamon Brown for the ground, Blue Grass and Ocean Wave for backgrounds. Just use a watertank brush or a simple brush with your Twinklings. I like to put a drop of water into the pots before I start using them, this way the colour dissolves in advance. I bought my Twinklings on ebay, because the time I started colouring with them, they weren't available in many shops over here. Please don't hesitate to aks additional questions and I will answer them and update this post :)Have a lovely evening! Twinkling H2Os bekommt man in 156 verschiedenen Farben, sie sind hart und werden in kleinen Töpfchen geliefert. Diese Töpfchen kann man in 2 Größen bestellen, ihr könnt aber beruhigt die Kleinern nehmen, die reichen ewig! Ich verwende meine Twinklings meißtens nur dafür die Schattierung meiner mit Aquarellstiften colorierten Motive zu intensivieren. Das obige Foto zeigt meine bevorzugten Farben (das ist aber nur eine persönliche Preferenz). Ich benutze Poppy Red für Wangen, Moss Green und Cinnamon Brown für den Boden, Ocean Wave und Blue Grass für den Hintergrund. Ihr könnt eure Twinlings einfach mit dem Wassertankpinsel oder einem normalen Pinsel verwenden. Ich tropfe auch noch gerne etwas Wasser in die Töpfchen, bevor ich sie verwende, um die Farben etwas anzulösen. Ich habe meine Twinklings über Ebay gekauft, da sie zu der Zeit als ich mit ihnen angefangen habe, nicht in vielen Shops erhältlich waren. (Aber das hat sich mittlerweile geändert). Wenn ihr noch Fragen habt, dann zögert nicht sie zu stellen und ich werde diesen Beitrag erweitern. Thanks for this tutorial, it is very useful. I have some H2O's but can never seem to get quite the same effect as my distress inks. I tend to get too much colour and it looks flat. What am I doing wrong? I also have 'US Art Quest Jewels Watercolour Palettes' which I think are similar to H2O's. There are 10 in a palette for £19.99. But again I still have a problem with my depth of colour. I have also tried to put a thin layer of colour using lots of water so I can possibly build up the colour but when I go to add another 'layer' the first layer comes off?? Why oh Why do I get it soooo wrong! Katharina thanks for all that info. I have some h2os but can't seem to get the shading with them. I also tend to have too much water on my brush with them. Any help greatly appreciated. Just a FYI, I just heard a couple of days ago that the company that makes the H2O's is going out of business so get them while you can. Luminarte Inc is going out of business, right now they are having a 40% off sale on all of their items. Wow, I never could make up my mind which colors I had to have. Katharina which website shows that they have that big sale. I checked LuminArt, which I believe is the maker but I don't see a change in prices. There is actually 168 colors in all, luckily I have them all so don't need to rush to buy them, but they are defintely worth their money. The twinkling H2O's are awesome to color with.. it is so sad that they are going to stop producing them. Thanks for the tutorial Katharina. I have a large tin full of these but dont really use tehm. My problem is I cant get the consistancy right. Add a drop of water, but to wet, cant get that creamy texture I see on the TV. Any idea's? ?